When I made the top "Diffusion", I ended up having some leftover segments when making the 9 patches. I had a lot of the off white/color/off white pieces leftover after I made my 9 patches. I realized when I added a colorful strip to each side of the off white/colorful/off white piece, I got an "H" - not a block that I had really wanted particularly. Back when my dad died in the summer of 2015 I checked out a few quilting books from our local library to occupy myself and to give me some ideas as to how to make some memory quilts from my dad's shirts. 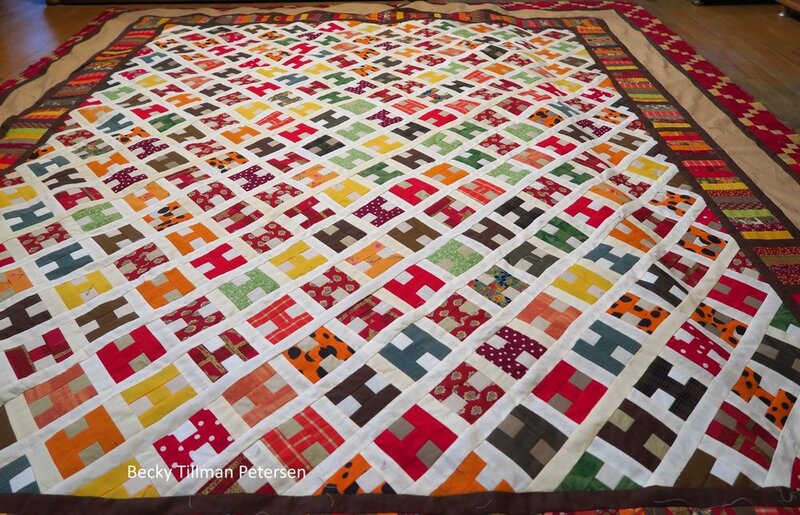 In those books were an "H" quilt and a "T" quilt.I was interested in the "T" quilt (my maiden name is Tillman) but I've not forgotten them - at the time I had no desire to make an "H" quilt since I don't have anyone in my family whose name starts with an "H" that I can think of right off the bat. But now I had literally hundreds of them in the works. I had better figure something out! By playing the "H"s at 90 degree angles to each other, I realized they now said "HI". So, I decided to put them that way and add sashing! This is now my third quilt made from this same set of upcycled fabrics - first was "Radio Waves", then "Difffusion" and now this one "HI". I have depleted this particular stash quite a bit - especially by making a piano key border using 1.5" strips. This let me cut up a lot of the misc. strange shaped leftovers in small strips and use them up. This quilt could effectively be stopped at any point with no border, the piano key one, or the tan one or like I made it. I wanted it bigger (that's why I added the borders) but I was out of gas with making "H's". I do not have the pattern finished for this one. I've not been on the computer a lot lately since I've been pushing to finish up some projects in the last few days. I'll see what I can do, but no promises as to when this one is coming. Here you can see that I used various shades of the background as in the "Diffusion" quilt - in the "H" blocks. But it still worked. The darker ones made it a little harder to see the design, but I think it worked out okay. And don't forget - if you need anything from my sis's store - be sure to check out the goodies she has for you!